ThreeCat Solar Fountain, Solar Water Feature with 1.4 W Floating Solar Water Pump Fountain Pump for Garden Ponds, Fish Tanks, Bird Bath and Pond, Aquarium, Garden, Decoration(No batteries) | Fountain City Art Ctr. ☆ Runs automatically by solar, no battery or power needed. Easy to use to different places. ☆ The pump starts automatically in 3 seconds as soon as it is exposed to sufficient sunlight. ☆ The Solar Bird Well has more than 10,000 hours of operation. The solar water fountain pump has a built-in brushless motor that provides longer life and lower energy consumption. ☆ Maximum spray height: 45cm (18 ''), Normal: 10 ~ 15 "
☆ Minimum water depth in wells should be 2 "
❶ Mount the product according to the sketch. ❷ Place it on the water and make sure that the solar panel is not protected from the sun. ❸ It will work perfectly as soon as the sunshine is enough. ❶ Please clean the pump regularly. ❷ Do not run the pump without water for a long time or the life will be shortened. ❸Please let the Solar Power Pump Kit get the full amount of direct sunlight to work (no shade or cloud). ✲ Beautiful Garden Fountain: Large water pump in the shape of a round with a relaxing sound creates a comfortable environment and makes your garden more dynamic and beautiful. ✲ Solar Powered and Built In Water Level Monitoring System :No external batteries or power needed, very environmentally friendly.The solar pump is designed with the function "water inductor"that works only in the water (water level range 30-50cm)and stops working immediately after leaving the water, avoiding shortening the lifetime if working without water. 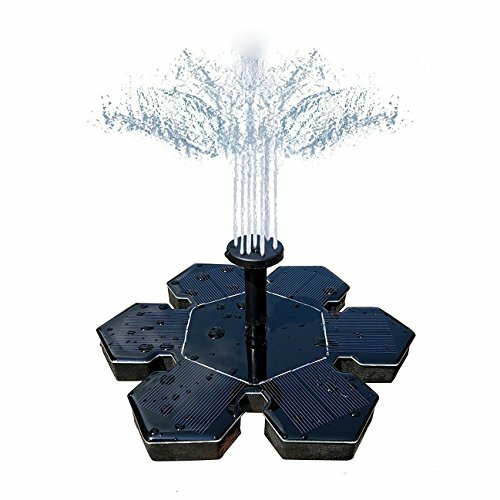 ✲ 4 Different Nozzle Spray :The Solar Fountain maximum flow rate can up to 150 L/h, Maximum water level up to100 cm, Maximum water jet height: 45 cm. Create different types of spray water and save water. ✲ Versatile and Compact Outdoor Solar Fountain: The beautiful round shaped water fountain can attract attention the birds,butterfies,perfect for bird bath,aquarium,small pond,garden decoration and water circulation for oxygen. ✲ Suggestion: The solar module must be completely exposed to sunlight, no part of it can be shaded or the pump will not work.